This movie is ideal for a calm and tender evening with a cup of cacao in the hand, on the sofa in a company of close friends. Or maybe alone. You won't be surprised and astonished by the creativity of the scenario. The movie has a simple plot, but still it's worth seeing, because it's not the fabula that will move you but the relationship and emotions of a man who is stuck in the body of a 14 years old boy. While watching I felt a lump in the throat several times. I think that this movie will touch those who don't live with their parents right now and especially those who remember difficulties in relationships with his old folks. It was a discovery for me when I remember that we didn't talk that much with my Dad and I know so little about him. I would say no more. I'm just sure that you will enjoy the pictures from the movie. It's 60ies, and remind me of "Le Petit Nicolas". They are much alike in their colors. But have totally different mood. 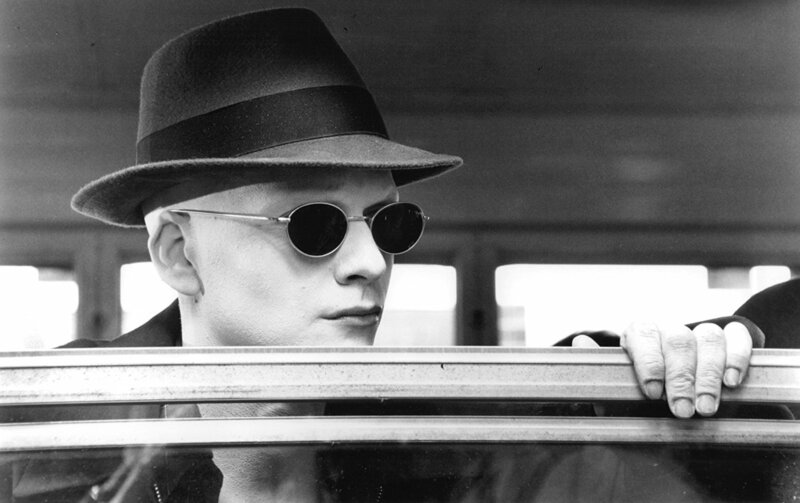 Jeremy Reed (Sean Patrick Flanery), whose nickname is Powder, is an albino who has incredible intellect and is able to sense the thoughts of the people around him. Jeremy's brain possesses a powerful electromagnetic charge, which causes electrical objects to function abnormally when he is around them, as well as when he becomes emotional. The electrical charge also prevents hair from growing on his body. Jeremy's mother was struck by lightning while pregnant with him; she died shortly after the strike, but Jeremy survived. His father disowned him shortly after his premature birth, and he was raised by his grandparents. Jeremy lived in the basement and worked on their farm but never left their property, learning everything he knew from books. He is taken from his home when his grandfather is found dead of natural causes. Jessie Caldwell (Mary Steenburgen), a child services psychologist called in by Sheriff Doug Barnum (Lance Henriksen), takes him to a boy's home because he is now effectively a ward of the state. Hank Grotowski (Billy Bob Thornton), a widower, and his son, Sonny (Heath Ledger), are corrections officers in the local prison. They reside in Louisiana with Hank's ailing father, Buck (Peter Boyle), an unwavering racist whose wife committed suicide. Hank's hateful attitude toward others, strongly influenced by his father, extends to his son, and members of the neighboring community. As Hank and Sonny assist in the execution of convicted murderer Lawrence Musgrove (Sean Combs), the proceedings prove too intense for Sonny, who collapses and then begins to vomit as he is leading Lawrence to the electric chair. Hank beats up Sonny in the jail's bathroom afterwards for being so "soft". Some time later, Hank drags Sonny out of bed and tells him to get out of the house. Unable to cope with the estrangement, Sonny grabs a gun. The confrontation ends in their living room with Hank at gunpoint, lying on the carpet, and Sonny in Buck's customary chair. Sonny asks his father, "You hate me, don't you?" After his father calmly confirms that he does and always has, Sonny responds, "Well, I always loved you," and then shoots himself in the heart. Hank subsequently buries Sonny in the back garden, quits his job at the prison, burns his uniform in the backyard, and locks the door of Sonny's room up tightly. Buck calls him a quitter. The film is an adaptation of Childers' memoir Another Man's War. 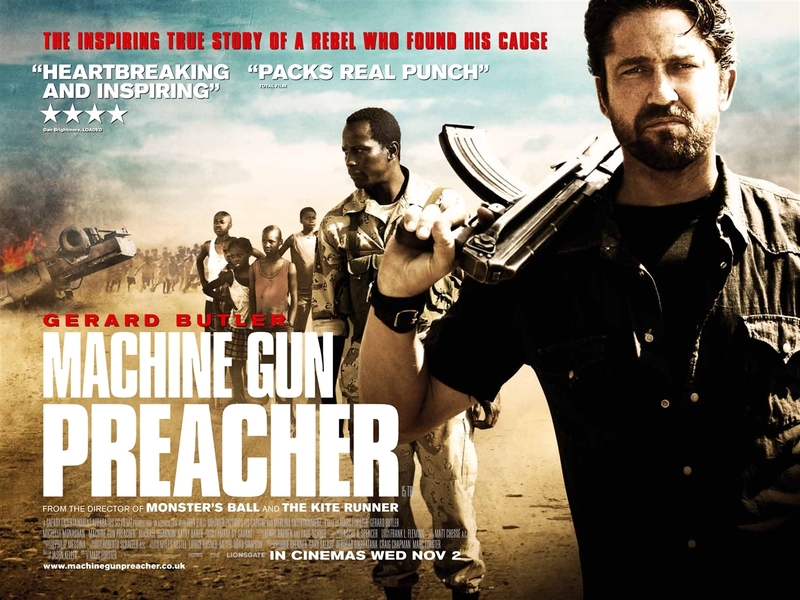 Although the film centers on Childers, it starts off with a scene in South Sudan, where the LRA are attacking a village. This opening scene is placed into context later in the film. Childers was an alcoholic drug-using biker from Pennsylvania. On his release from prison, he finds that his wife has given up her job as a stripper, because she has since become a Christian. Eventually, after almost killing a vagrant the night before, his wife persuades him to go to church with her where he is eventually converted. Later, on a missionary trip to Uganda to build homes for refugees, he asks one of the SPLA soldiers watching over them to take him on a trip to the north, to Sudan. The soldier warns him that it is a war zone, but upon Sam's insistence they go. They arrive at a medical tent in Sudan, as his friend moves off to talk came in to some people, Sam is roped in by a redheaded female doctor to help lift a lipless Sudanese woman onto the examination table. That night as they lay on their beds at the relief station, they hear noises outside, when they look out Sam and the soldier see large numbers of Sudanese children swarming in to sleep outside the building. The soldier explains that their parents send them to sleep over there because it is safer than staying in their own village. Sam wakes up the children and gets them to sleep in their room for the night. The next day they follow the children back to their village only to find that the LRA burnt it down and killed their parents. Then one of the children runs after his dog and dies upon stepping on a hidden landmine. Sam then decides to build an orphanage for the children of South Sudan. After the orphanage is built, the LRA attack it under cover of night and burn it to the ground. Sam then phones home, telling his wife what happened and that he is giving up. She reminds him that the orphans have been through worse but they have not given up, and that he should not give up and tells him to rebuild the orphanage. Poongsan, whose real name is never revealed, is a mysterious messenger who crosses the demarcation line between the two Koreas, delivering letters and cherished heirlooms between separated families in Seoul and Pyongyang. One day he is commissioned by South Korean government agents with the task of smuggling in In-ok, the beautiful lover of a high-ranking North Korean defector, into the South. Yet things take an unexpected turn when the deliveryman falls for the young woman, but their romance is put in jeopardy by the obstacles they encounter. Part love story, part postwar tragedy, with a dose of comedy thrown in, the low-budget film Poongsan depicts the sad reality of the division between the two Koreas.